I AM OVERJOYED TO SHARE THAT WE HAVE RAISED OVER $2,500.00 IN THE FIRST WEEK OF “BEAUTY ON THE WING” ONLINE FUNDRAISER!!! MY DEEPEST THANKS AND GRATITUDE TO NEW ENGLAND BIOLABS, LAUREN M., MARION F., ELAINE M., DONNA STOMAN, PEGGY O’MALLEY, JOEY C., CATHERINE RYAN, JOEANN HART, JANE PAZNIK BONDARIN AND ROBERT REDIS (BOTH FROM NEW YORK), NUBAR ALEXANIAN, PETER VAN DEMARK, PATRICIA VAN DERPOOL, FRED FREDERICKS, LESLIE HEFFRON, JIM MASCIARELLI, DAVE MOORE (KOREA), LILIAN AND CRAIG OLMSTEAD, TOM HAUCK, AND ANONYMOUS PERSONS FOR THEIR GENEROUS HELP. Monarchs roosting overnight in the old chokecherry tree. We have had four beautiful waves of Monarchs pouring into Cape Ann. The first arrived on September 23rd and the fourth departed last Wednesday morning, on the eleventh of October. 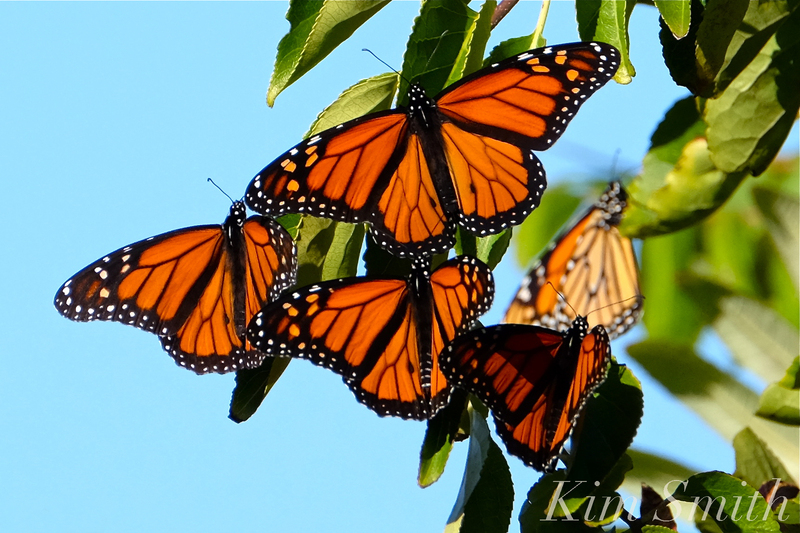 As there are reports of Monarchs still further north, we should be expecting at least one more wave, quite possibly this week. 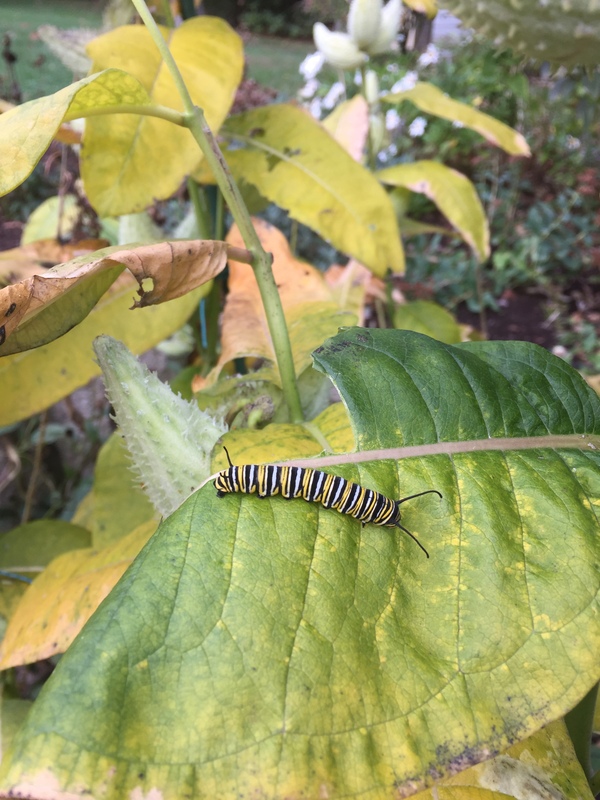 And, too, my friend Patti found several Monarch caterpillars in her garden only several days ago. These caterpillars won’t be ready to fly to Mexico for another week to ten days at least. If this warm weather continues, we may still yet have more batches coming through in the coming weeks. 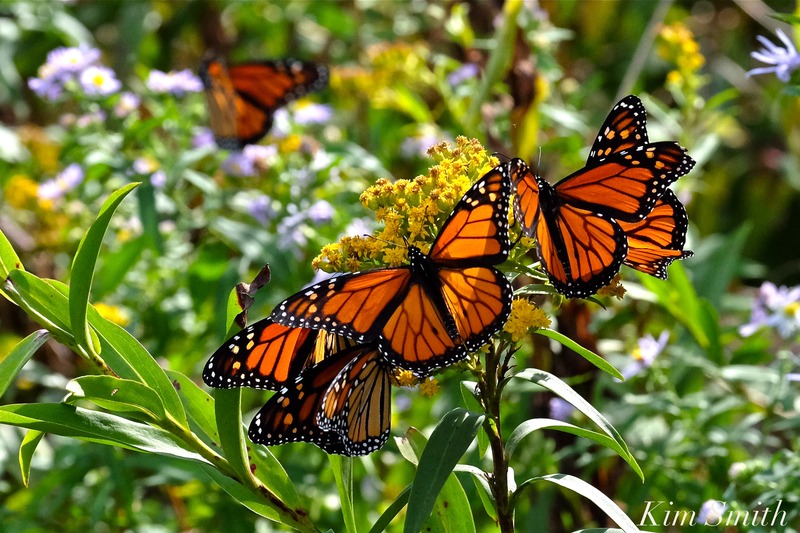 What can you do to help the Monarchs, Painted Ladies, bees, Ruby-throated Hummingbirds, and all pollinators at this time of year? Don’t tidy up the garden just yet! When you cut back remaining flowering stalks and sprigs, you are depriving winged creatures of much needed, and less readily available, nourishment. 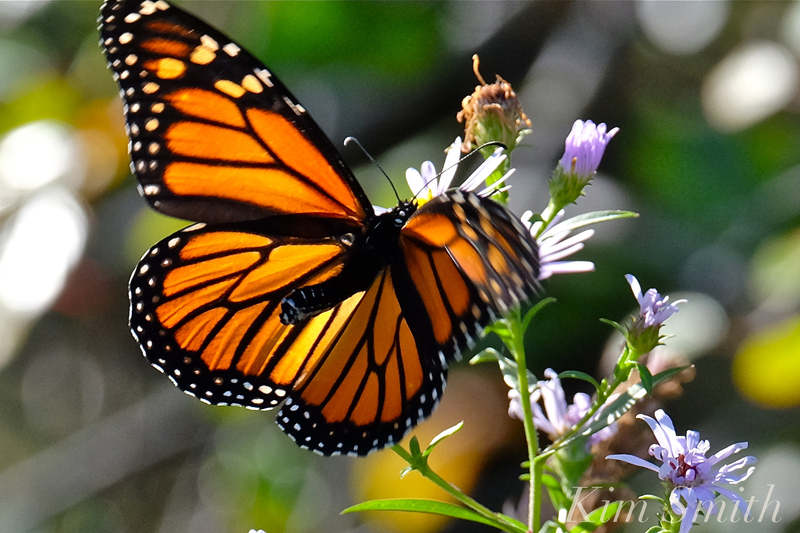 Bees, and migrating butterflies on the wing, especially Monarchs, need nectar throughout their journey to Mexico. Songbirds eat the seeds of expiring flowering stalks. I keep my client’s gardens neat and tidy at this time of year by pulling out the occasional dead plant and trimming away dried out foliage. In deference to the pollinators, the very best time of year to plant bulbs and organize the garden for the following year is after November 1st, at the very earliest. And even then, if for example my Korean Daisies are still blooming, I work around the plant. Usually in November and up until the first frost, it is covered in bees. I’ve had many a Monarch pass through my garden in November and the Korean Daisies were there at the ready to provide nectar for weary travelers. This entry was posted in Angangueo Michoacán Mexico, Gloucester Massachusetts, Lepidoptera, Monarch Butterfly, Monarch Butterfly Film, Monarch Butterfly in Crisis, Monarch Butterfly Migration in crisis and tagged Beauty on the Wing ~ Life Story of the Monarch Butterfly, Cape Ann, Eastern Point, Fundraiser, Monarch butterfly, Monarch Butterfly Film, Monarch Butterfly Migration, when to clean up your garden for butterflies on October 16, 2017 by Kim Smith.